"3-2-1 Action" - Part 3: "Pal"
Jimmy tears open Clark's shirt and tells his friend that he knows he's Superman. Jimmy tells him that he just suddenly knew. Then Jimmy proceeds to tell him how he helped against the Kryptonite Man. The Kryptonite Man had Superman incapacitated when Jimmy used his signal watch and Krypto arrived. Krypto attacked the Kryptonite Man while Jimmy developed solar powers to heal Superman. Recovered, Superman attacked the Kryptonite Man and used a chunk of lead glass to reflect his radiation back at him. The Kryptonite Man overloaded and melted down into the building foundation. Outside, Jimmy rushed to change into his street clothes and get Krypto, sick from the radiation, to safety. In the present, Jimmy tells Clark that Krypto is doing well and resting at his apartment. Jimmy tells Clark he wants to join the Justice League to get help with his powers, and as Superman flies away he agrees that it's a good idea. The next day Jimmy is playing with Krypto when suddenly the dog gets excited. Heading out, they find the giant gorilla is attacking the park. 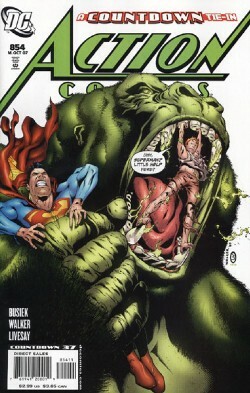 Krypto fights him for a few moments, before Jimmy uses his powers to grow to the gorilla's size. Jimmy prepares to punch him, when he realizes that he doesn't need to fight. He calms the monkey and he shrinks down to normal size. Superman and Jimmy turn the monkey over to S.T.A.R. Labs. Superman goes to meet Krypto, but when he tries to bring him back with him the dog cries. Superman realizes that Krypto has always been happiest around young people, so he'll let him stay with Jimmy. As Jimmy takes Krypto for a walk, he thinks that this is the start of a beautiful friendship. Story - 4: I've got some serious problems with this issue, but for the most part they are entirely on the editorial side of things. It's really annoying that yet another huge development for Jimmy, finally learning Clark's secret, happens outside of the Superman books. However, you really can't put any of that on Busiek. This was, by far, the best issue of this trilogy. Jimmy was handled well, and we got some great Krypto stuff. Overall though, I'm just really happy to see this Countdown tie-in ending. Busiek's stuff on the title has been phenomenal, and it's a shame to waste him on this. Art - 3: Some good in here, but some bad as well. I really like Walker's Krypto, but his Superman leaves a lot to be desired. And his Jimmy is all over the place. Sometimes his looks great, but sometimes he just looks goofy. Average stuff at best. Cover Art - 2: These covers have been the worst part of this issues. Titano looks good, but the praise stops there. Jimmy looks awkward and Superman looks horrible. Add in the white background and this cover just really doesn't have any redeeming qualities.